A group was formed to preserve and restore the shelter for the benefit of the community. 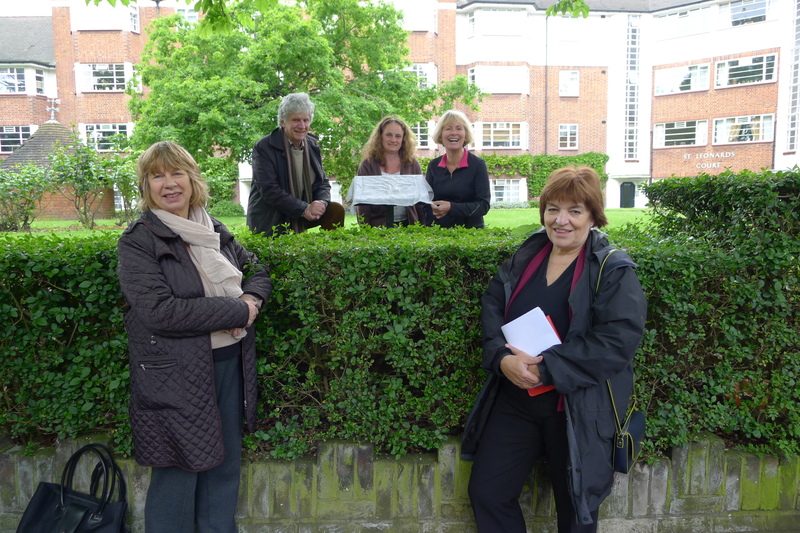 The group consists of the Mortlake with East Sheen Society, Barnes and Mortlake History Society, Environment Trust of Richmond upon Thames, St. Leonard’s Court Residents Association and Richmond Council. 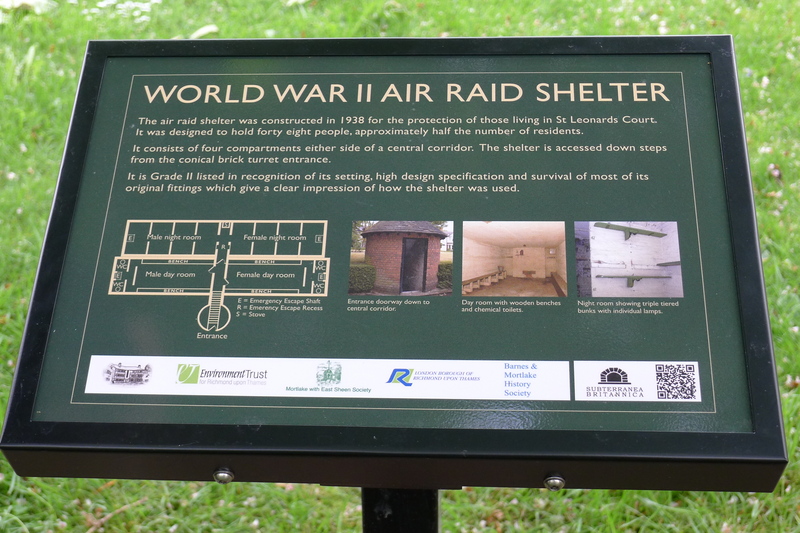 We have raised funds for the installation of a plaque (see photo) on the site giving information about the shelter and for the relevant surveys to be performed to enable us to apply for a grant for restoration. The air raid shelter was probably built in 1938, to serve St Leonard’s Court which was built between 1934-38 by local builder, Mr FG Fox, who also developed Deanhill Court and Queen’s Court, to the east of Richmond, at much the same time. 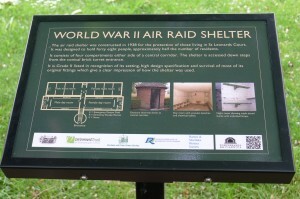 The air raid shelter at St Leonard’s Court was designed to hold forty-eight people, roughly half thenumber of flats, although not all flats may have been occupied at that time. 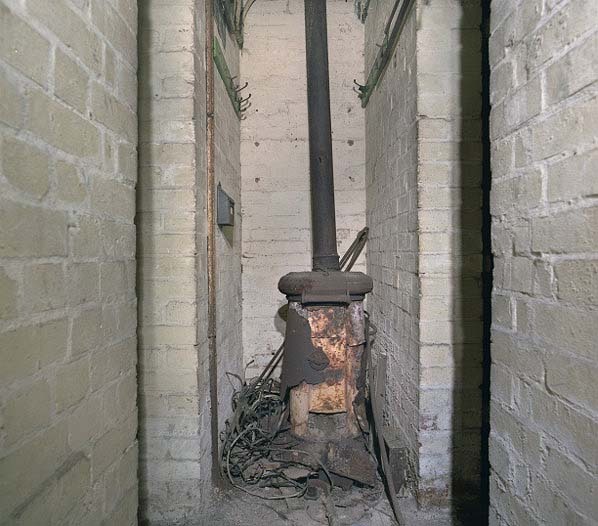 It consists of four compartments either side of central corridor, running from the entrance, which descends via steps reached from a brick conical turret. The shelter is under an earth-filled turfed mound within a brick retaining wall. Under the wall and extending out beyond it is a metal plate (it is not known if this extends across the whole of the shelter), so that the whole was intended to resist blast but was landscaped to form part of the gardens of the Court where it is encircled by the entrance drive. The turret is of brick with a tile roof and is topped off by a metal weather vane. The shelter is of brick and concrete block, with flat concrete slab roofs. The south eastern section has a rendered plinth presumably added to counter rising damp. 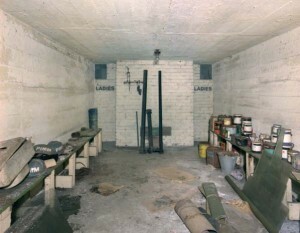 The shelter is divided into day and sleeping areas, for men and women. 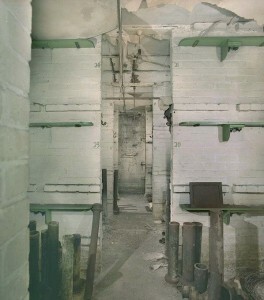 Each section has an exit ladder at the outer end leading to a vent. There is no apparent seal against gas attacks. Day sections are lined with wooden benches and have a pair of chemical lavatories at the outer end behind a screen. Night sections are divided into four sections either side of a central passage, each with bunks. Above each bunk is an individual electric light socket behind a wooden panel designed to shade the light; each bunk has a numbered hook. In the passage is a row of similarly numbered hooks and a stove with a ventilation pipe rising from it. 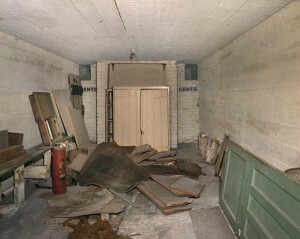 The shelter survives essentially as it was left in the 1940s, complete with small evocative fittings such as a light bulb packet used as a lampshade.